In Nigeria alone, 300 Christians were martyred last year. 200,000 to 400,000 in North Korea suffer extreme brutality; 50,000 to 70,000 are held in ghastly prison camps. Many churches are still denied worship privileges and pastors are jailed in China, the largest population of persecuted Christians — 80 million. Fellow believers in India watch helplessly as churches are demolished and Christians are beaten by Hindu extremists. However, through all of these trials, they report that there is also good news: Many are coming to Christ, in spite of or even because of persecution. Our brothers and sisters are using all their strength to stand up and share the love of Christ, even in the hottest spots on earth… but they need our prayers! When Paul and Silas were unjustly imprisoned in Philippi, they prayed and sang songs to God, in spite of being beaten and placed in the inner prison. The end result was that all those in the prison house, heard their witness to the Lord, and the jailer became saved (Acts 16:31)! 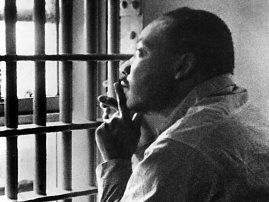 As we commemorate Martin Luther King, Jr. Day, we reflect on his letter that he wrote from jail, when he was unjustly imprisoned, in Birmingham, Alabama, on April 16, 1963. …I am in Birmingham because injustice is here. Just as the prophets of the eighth century B.C. left their villages and carried their “thus saith the Lord” far beyond the boundaries of their home towns, and just as the Apostle Paul left his village of Tarsus and carried the gospel of Jesus Christ to the far corners of the Greco-Roman world, so am I compelled to carry the gospel of freedom beyond my own home town. Like Paul, I must constantly respond to the Macedonian call for aid….. There will be the young high school and college students, the young ministers of the gospel and a host of their elders, courageously and nonviolently sitting in at lunch counters and willingly going to jail for conscience’ sake. One day the South will know that when these disinherited children of God sat down at lunch counters, they were in reality standing up for what is best in the American dream and for the most sacred values in our Judaeo-Christian heritage, thereby bringing our nation back to those great wells of democracy which were dug deep by the founding fathers in their formulation of the Constitution and the Declaration of Independence. Never before have I written so long a letter. I’m afraid it is much too long to take your precious time. I can assure you that it would have been much shorter if I had been writing from a comfortable desk, but what else can one do when he is alone in a narrow jail cell, other than write long letters, think long thoughts and pray long prayers? Martin Luther King, Jr. Day, is a holiday marking King’s birthday. He was born on January 15, 1929, with this year marking his 83rd birthday. The holiday is observed on the third Monday of January each year. Dr. King was a Baptist minister, and the chief spokesman for nonviolent activism in the civil rights movement, which successfully protested racial discrimination in federal and state law. International Justice Mission (IJM) reports that 2011 was IJM’s most successful year yet! More than 1600 children and families rescued from trafficking, forced labor slavery, illegal detention and other forms of violent oppression. More than 100 traffickers, rapists and other criminals convicted for their crimes. Nearly 1000 members of Thailand’s hill tribes received the citizenship documentation critical to protecting them from trafficking and other violence. More than 4000 people given help and hope by IJM aftercare. To name some of the areas of God’s victory and success! So, as we enter 2012, there are still many more people throughout the world in need of rescue and help, as our Lord uses organizations such as IJM. International Justice Mission is a human rights agency that secures justice for victims of slavery, sexual exploitation and other forms of violent oppression. IJM lawyers, investigators and aftercare professionals work with local officials to ensure immediate victim rescue and aftercare, to prosecute perpetrators and to promote functioning public justice systems. So, we thank and praise God for these victory’s in using ministries like IJM in so many ways to serve Him! Pray for their work, that our Lord would protect those who are on the front lines of confronting terror, and evil perpetrators, as well as, those who are being rescued and helped!